The suspect wanted for the killing of Nipsey Hussle has been arrested and is in police custody as of Tuesday afternoon, according to LAPD headquarters. L.A. County sheriff's officials said they received a call shortly before 1 p.m. about a man that matched the description of the suspect, Eric Holder, in the 9000 block of Artesia Boulevard in Bellflower. They detained Holder without incident. LAPD officials thanked the community and their partners at the L.A. County Sheriff's Department for their "heightened awarness/vigilance" during the search. On Sunday, Holder allegedly confronted the rapper and community activist over a "personal matter" before fatally shooting the 33-year-old and wounding two other men at a South Los Angeles strip mall, according to police. The shooting occurred on West Slauson Avenue near Crenshaw Boulevard outside The Marathon Clothing, a business the 33-year-old Hussle opened in the Hyde Park area in 2017. Moore said the rapper was standing in front of the store with two men when the suspect "walked up on multiple occasions and engaged in a conversation" with Hussle. The suspect initially left the scene, but then returned, armed with a handgun. Moore said the man then "purposefully and repeatedly fired" at Hussle and the other two men, striking all three before fleeing in a 2016 white Chevy Cruze, which authorities said was driven by an unidentified woman. Chief Moore asked that anyone with information about Holder or the getaway driver to contact them before urging the suspect to peacefully surrender. "There should be no safe haven for this individual," he said. Hussle, whose real name is Ermias Asghedom, was a prominent activist and advocate for L.A.'s black communities. As news of his death spread overnight Sunday, community members and fans of the Grammy-nominated artist created a memorial at the site of the shooting. Moore also provided new information about a vigil at that site Monday night, which devolved into chaos after a person in the crowd pulled out a handgun, allegedly to show it off. Someone else in the crowd saw the weapon and attempted to disarm the person, according to Moore, which caused panic and led to the "stampede" of people. In that chaos, one person was stabbed, the chief said, though it's unclear who was responsible. Several other people were injured from tripping and falling, sprains and being cut by broken glass. "I'm not questioning their account, but I'm lacking information that a shooting occurred," the chief said. City workers have removed the debris from the scene of the vigil, according to Moore, and officers had taken steps to "safeguard the items of memorial that were not damaged for the family" and reopen the memorial for people to return. "I ask for you to bring peace and not allow this sacred ground to be the site of any further violence," Moore said. Hussle's death marks one of 11 homicides throughout the city of L.A. in the last week alone, according to Mayor Garcetti, who vowed to address a specific uptick in violence and shootings in South L.A. in recent weeks. Authorities said the community experienced an average of nearly 15 shootings a week in March. That was up substantially from the average of about five a week in January and February. Chief Moore tweeted Sunday night about a "troubling surge" in gun violence in L.A., reporting that 26 people had been shot and 10 others killed in the city since the previous Sunday. "I ask everyone that is grieving for (Hussle) to grieve for the other families as well, whose lives were... just as important," Garcetti said. "The absolute worst way to pay back Nipsey's loss... is with more violence." City Councilman Marqueece Harris-Dawson, who represents Hyde Park and other South L.A. neighborhoods, paid tribute to Hussle as "a son and grandson of South Los Angeles" and "a shining example of the best of what we can be and the best of what it means to seek and carry out a redemptive charge." 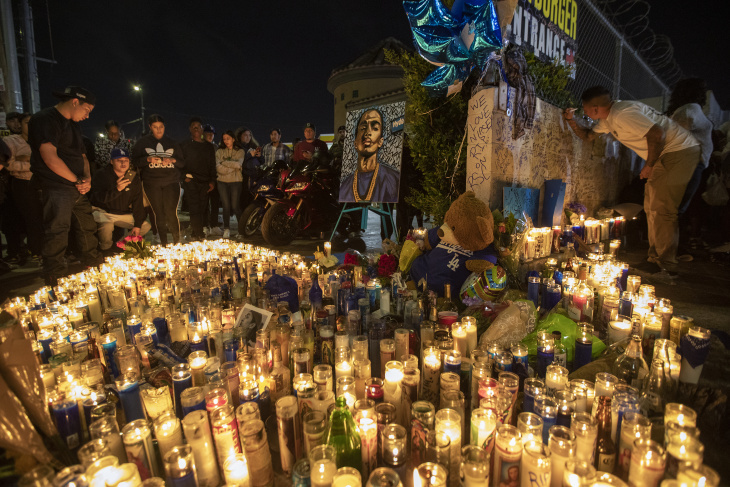 "Nipsey is an example for all of us that any life lost is one life too many," he said. Chief Moore and LAPD Commissioner Steve Soboroff had been scheduled to meet with Hussle Monday, April 1 at the rapper's request, where they planned to discuss ways to collaborate to stop gang violence and help black youth in South L.A. But on Sunday, Chief Moore received word of a shooting death in South L.A. and saw the victim's name. "I could not believe it," Moore said. "Nipsey Hussle represents the enormity of the lives that we have lost. This is a voice that was trying to help and was investing in his community." Reading from an email he received from Hussle and talent agency Roc Nation on Feb. 26, Soboroff reiterated what the rapper hoped to get started: "to work with the department to help improve communication, relationships and work towards changing the culture and dialogue between LAPD and the inner city." "Here was somebody coming in to say 'how can we help?'" Soboroff said, wearing the tie he'd laid out for the meeting that never happened. Soboroff still hopes to have that meeting with Roc Nation and Hussle's family when they're ready. "I want to help do what he wanted to do," he said. 2:15 p.m. This article was updated to reflect reports from LAPD that the alleged killer, Eric Holder, is in currently in custody in Bellflower. Officials were waiting for LAPD detectives to arrive, in order to confirm his identity. 2:35 p.m. LAPD has confirmed that the suspected killer has been arrested and is in custody.